While organizing our series books, I came across this series and the title was so amusing to me that I had to post it here: Yes, that's right. The PONY-CRAZED PRINCESS. Series. I don't know what I like the most about it. The use of the word "crazed" in a children's book series title? Or the cartoon pony with a photo of a real horse hanging up in its stable? Oh my goodness! Now I finally know what to give those girls that love horses AND princesses. And as of today our library is the proud collector of a series called Mermaid S.O.S. the relevant line: "If publishers ever release 'Magical Princess Ponies and their Fairy Unicorn Friends and Zac Efron and OMG that Twilight Guy,' we are doomed." I started buying this particular series with book #1, and they are never in. 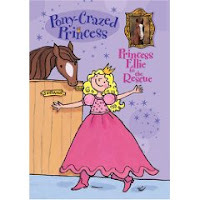 The combination of horses and princess really is too much for some girls (and boys--I know of at least one devoted boy Pony-Crazed Princesses reader at my library) to resist.